Our backstory is an American success story - starting with John Saul’s arrival in the U.S. in 1851. He was an acclaimed horticulturist and landscape architect who assisted in the planning and the development of the National Mall in Washington D.C. and served as the first chairman of Washington D.C.’s parks commission. He published several catalogs offering fruits, evergreens, ornamental trees, shrubs, roses and greenhouse plants. His insight was invaluable. After selling the nurseries, his son founded a banking and real estate business in the late 19th century with the vision to start B.F. Saul Insurance. He was focused on providing exceptional service and doing it the right way based on excellence, ethics, and results. We keep that tradition alive today. The pear has been revered as a symbol of prosperity for thousands of years. For B.F. Saul Insurance the pear symbolizes our past, and our future. 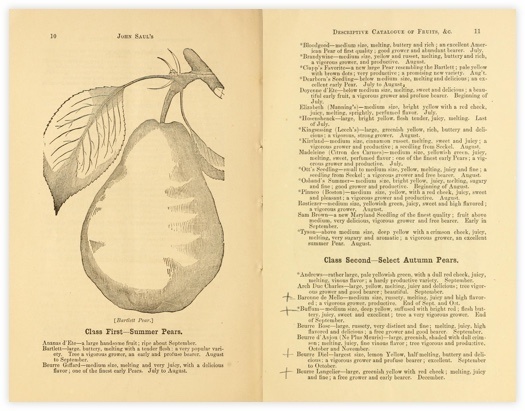 In fact, our logo includes a 19th century drawing of a Bartlett pear from one of John Saul's descriptive catalog of fruits. Thinking back to John Saul's arrival in the US, he was planner, a teacher - he liked to grow things. He challenged assumptions and brought new insights. We are in the business of protecting prosperity. Our role is to provide unique and valuable perspectives on the insurance market. Help you navigate alternatives. Provide ongoing advice and help you to avoid potential pitfalls. Educate you on new issues and outcomes. Challenge you to think differently about your business. What Differentiates B.F. Saul Insurance? It starts with our independent family ownership. With significant financial means that are supported with long-term returns, our business model allows us to invest in resources relevant to our clients. We are not a roll-up of regional agencies. We believe that being private is essential to achieving this growth – now and in the future. There are several measures in place to perpetuate our private and independent ownership. We begin by understanding your business priorities and the unique industry exposures impacting your operation. An awareness of these exposures provides the necessary context to provide relevant advice. Honestly, this is the best part of the job. We have meaningful experience with clients in the commercial real estate, not for profit, association, and professional services industries. We then couple this expertise and experience to you. Since we are a direct to market model, the associates who work to understand your risks and business priorities, are the same people who negotiate and structure your program in the global market. This allows for your message to be conveyed to the insurers on a more direct basis – this affords the best possible results in the market. A requirement for growth is our ability to retain clients each year. On average, we retain about 95% of our clients every year, many have been with us for more than 10 years. The industry average is about 80-85%. The most effective way to retain clients is to retain our talent; the people who actually understand your business and can effectively advocate on your behalf in the market. We are passionate about maintaining the focus on keeping our clients and finding new ones. That is all we do.